The Osprey is a cosmopolitan raptor that breeds or migrates on all continents except Antarctica, as well as on many oceanic islands. Ospreys occur in a range of habitats, but always near water. This species feeds almost exclusively on live fish, which are usually taken in shallow water. Ospreys have oily, somewhat water-repellant feathers, and long, unfeathered legs to help them stay dry as well as flexible outer toes, and small, spiky scales covering the soles of their feet to help them hang on to their prey. Because they feed on fish, Ospreys sometimes are viewed as a threat by fishermen and aquaculturalists. In North America, the widespread use of DDT caused Osprey numbers to decline precipitously during the 1950s, 1960s, and 1970s. Following the ban on the widespread use of this pesticide in 1972, many populations of Ospreys recovered. Today, Ospreys continue to increase in number. Ospreys are large, eagle-sized raptors. The species has long, thin, gull-like wings and flaps with stiff and deliberate wingbeats. In flight, Ospreys hold their wings in a “crooked” position that gives the species a distinctive “M”-shaped profile. The Osprey has a mostly white head with a thick dark-brown eye stripe that continues down its neck and onto its back. Adults have yellow eyes, dark chocolate-brown upperparts and mostly white breasts and bellies. Juveniles largely resemble adults except that their eyes are orange-red and their brown contour feathers have cream-colored edges. Female Ospreys typically are larger than males and often have more dark speckling on their breasts. Ospreys are usually monogamous and rarely polygamous. Pairs repeatedly return to the same nest site, and often remain together for many years, sometimes, for life. Older individuals and, in particular, pairs that have bred together previously, tend to be more successful than newly formed pairs. Most Ospreys do not return to their breeding grounds until the spring of their second year, and a few remain on their wintering grounds until the spring of their third year. Ospreys typically breed for the first time when they are three or four years of age. Males return to the breeding grounds before females and select the nest site. Some males perform aerial displays even before females arrive. The displays, which peak after the female arrives, allow the male to “mark” his territory and to solicit the attention of a female. So called “sky dances” usually begin and end at the nest site, and while performing the display, males usually carry a fish or nesting material and call repeatedly. “Sky dances” incorporate undulating flights, which sometimes reach heights of 300 feet or more. At the top of each undulation, males typically hover briefly with their legs dangling and their tails fanned, and then dive downward with their wings drawn in. They may repeat this sequence several times. During courtship, males also provide food for their mates, follow them closely, and chase away other males. Ospreys prefer to build their large stick nests near water at sites with good visibility and limited access for predators. Typical nest sites include dead or relatively open live trees in or within a few kilometers of open water. Cliffs, rocky outcrops, and even cacti are sometimes used. On rare occasions, Ospreys nest on the ground. They also nest on utility poles, duck blinds, channel markers, and nesting platforms erected specifically for them. Nests usually are renovated and reused annually either until the base collapses or until the nest is damaged in a storm. Nests often are five feet across and two to three feet deep when they are first built and increase in size each year thereafter. Smaller birds, including House Sparrows and Monk Parakeets, sometimes nest within an Osprey’s nest. Osprey pairs can construct their nests in as few as seven to 10 days. Males gather most of the material for the main structure and females collect most of the material for the nest lining. Although pairs defend the immediate area around the nest, Ospreys sometimes nest in loose colonies in areas where prey is abundant. Ospreys typically lay two or three egg clutches. Incubation begins when the first egg is laid and clutches hatch asynchronously. When food is limiting, younger chicks that are unable to compete with their larger, older siblings often starve. Females do most of the incubating during the 34 to 40 day incubation period. After the eggs hatch, the female broods the nestlings continually for ten days. Throughout this period, the male provides food for the female. Nestlings are able to feed themselves when they are about six weeks old, at which time females begin to hunt for themselves and their young. The young leave the nest when they are seven to eight weeks old, and will continue to roost at and around the nest for another month. During the day, fledglings perch near the nest and will sometimes fly after the male begging for food while he hunts. Young usually catch their first fish two to eight weeks after fledging. Although there are anecdotal reports of Osprey catching mollusks, snakes, birds, and mammals, fish comprise more than 99% of the species’ diet. Unlike the Bald Eagle, Ospreys usually do not feed on carrion. Most Ospreys are opportunistic and feed on the most accessible, abundant, and appropriately-sized fish available. The species is not designed for deep diving and most fish are caught at or near the surface. Ospreys usually search for their prey from the air. Doing so is more energetically costly than perch-hunting, but it enables Ospreys to search for food across greater areas. Perch-hunting is more common in winter when individuals only need to feed themselves. While hunting, Ospreys fly slowly over the water and often hover briefly when scanning intently. When an Osprey detects a fish, it tucks its wings and drops toward the water. While descending, the Osprey uses its wings and tail to adjust its position. Ospreys plunge into the water feet-first with their legs and talons fully extended. After diving, Ospreys rest for a moment on the water and secure their grip on their prey before taking off. Once airborne with a fish, Ospreys place one foot in front of the other, and rearrange the fish so the head faces forward. 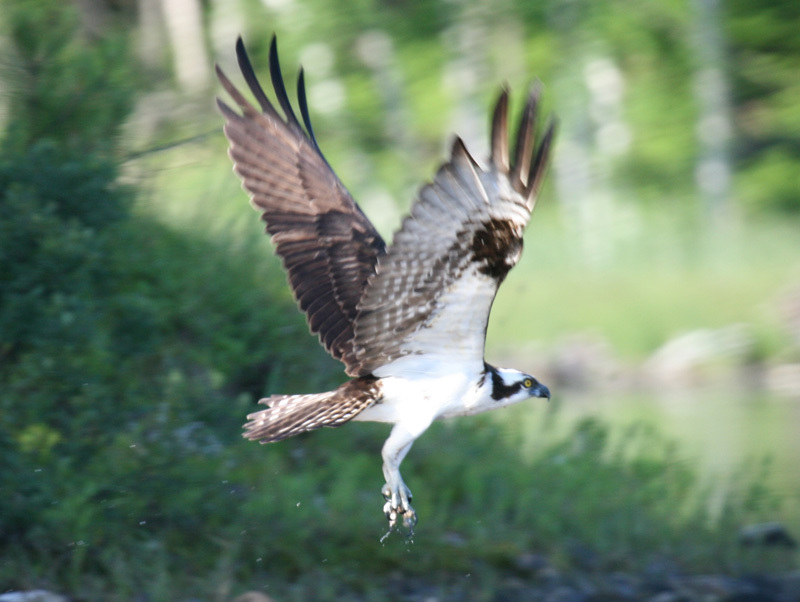 The Osprey’s flexible outer toe allows it to carry fish with two talons securely placed on either side of its prey. Hunting success depends on the age of the Osprey, type of fish, and weather. Young Ospreys are less proficient hunters than adults. Ospreys typically catch slow-moving, bottom-dwelling species and are least adept at capturing fast-moving fish. Hunting becomes more difficult in choppy and murky water. The presence of emergent and submerged vegetation also decreases hunting success. Ash, Lydia M. “Falconry Birds.” The Modern Apprentice : Falconry Birds. Lydia M. Ash. 29 June 2009 .